In Time FOR CHRISTMAS!! ORDER NOW! 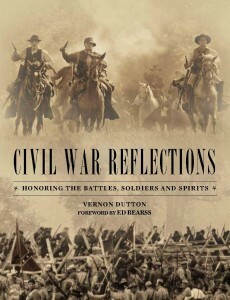 Many books have addressed America’s Civil War, but “Civil War Reflections: Honoring the Battles, Soldiers and Spirits” provides a completely different outlook. Telling the story with dramatic images taken during actual reenactments, “Civil War Reflections: Honoring the Battles, Soldiers and Spirits,” is a colorful coffee table book that brings history to life in a powerful and personal way. The poems cover a wide range of topics; some introduce fellow reenactors; others detail the travails of Civil War ancestors. There is even one about Father Abram J. Ryan, the poet-priest of the Confederacy. 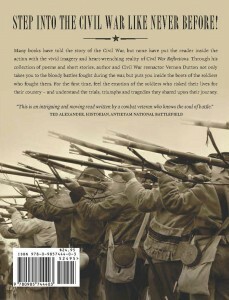 In addition to these powerful poems, the book includes the short story, “A Line in the Sand,” which exhibits the ardor and patriotism of the men in the ranks, and a one-act play, “All Hallows Eve,” which adds the mystery of a hidden dimension by involving Civil War soldiers during All Hallows Eve. What can you expect from Civil War Reflections? If you want to know what the Civil War Soldier had to learn just to stay alive, you are in the right place. We will teach you how they marched; the way they carried their muskets; what equipment they used; and give you information about upcoming Civil War Reenactments taking place during the 150th Commemoration of the Civil War. We might even get around to discussing some of the Civil War Battles. Also, let me know what you want to see from this site. Drop me a line as I’d love to hear from you to make this site the best it can be for you. One of my greatest highlights from participating in Civil War reenactments was meeting General John Bell Hood. 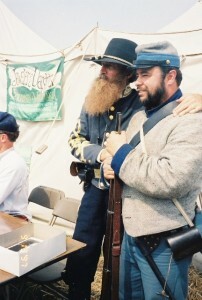 Patrick Gorman, who portrayed Gen. John Bell Hood, in the movie, “Gettysburg,” is pictured with one of the reenactors at the 135th Antietam Reenactment in Maryland during the weekend of September 13, 1997. I had the privilege of attending the reenactment as a soldier in the Texas Brigade, commanded by General Jack King. It was a thrill of a lifetime. This was probably the second highest attended reenactment of all time with an attendance of 14,000 reenactors. Patrick Gorman portrayed Major-General John Bell Hood during the weekend. He was given a horse to ride and every time he rode through our camp we would all stand up and yell, “Hood, Hood, Hood!” On the morning of the second reenactment day we were to portray Hood’s Brigade attacking through “The Cornfield.” We got up before dawn, formed up and waited while the Union artillery had their barrage. Just before we went on the attack, Gorman in full uniform and makeup walked down our line, shook our hands and wished us well. We addressed him as General Hood and it was one of the highlights of the reenactment for me. It was a thrill beyond belief that he would get up that early and come wish us well. It really made this reenactment the best I have ever attended.